Hola Amigos of the Estero el Salado, our environmentally protected area in Puerto Vallarta. We invite you to celebrate World Environment Day with us on June 5, 2013, from 10:00 am until 4:00 pm. Entrance is free and we will meet at Gate 4 of the Estero el Salado (across from the Naval Hospital just south of Marina Vallarta). 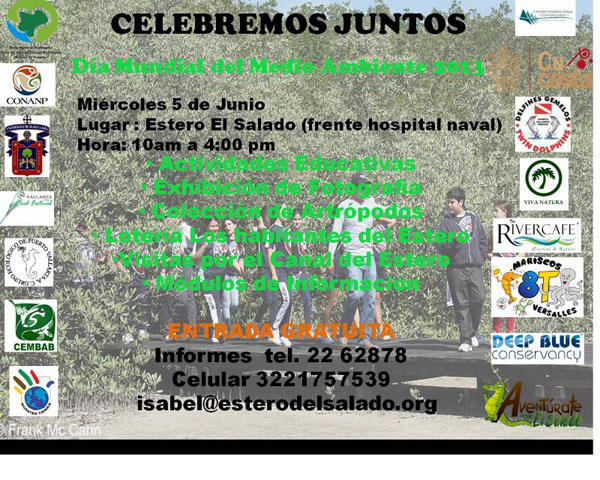 For more information, telephone (322) 226-2878, by cellular at (322) 175-7539, or email us at isabel@esterodelsalado.org. We look forward to see you on June 5. Translated and edited by Team Angels.